Bushnell is one of the leaders when it comes to making good quality laser golf range finders. 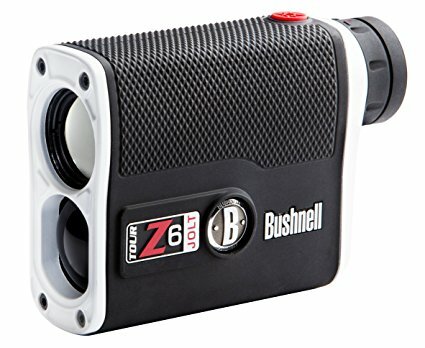 The Bushnell Tour Z6 is one of their leading models and is widely used by golfers in the US and around the world. Its ease of use and fast and accurate measuring ability makes it a favorite with golfers of all levels, and with the features it offers it provides a really consistent measuring tool. Being small and portable is important for any golf range finder. If it is too large it will just become a hindrance and probably not get used as much. But the Bushnell Tour Z6 is a really compact size and very light too, so it can even be carried around in the pockets of your pants if you wanted to. The speed in which it can return the accurate measurements for you make it a very efficient part of your golf equipment. To ensure that the Bushnell Tour Z6 will always give you the accurate measurements it needs, it is housed in a waterproof case and the lens has a RainGuard HD lens coating so that no water can leak inside of the unit. This will give you a lot of use from this rangefinder and help it perform to its optimal levels so you can do the same on the golf course. The maximum range of the Bushnell Tour Z6 is up to 1,300 yards and also has a 6x magnification lens zoom. It uses a pin finder too, and you get a 450 yard range capacity with this. Using this feature will allow you to home into the pin and get an exact measurement to the flag from up to 450 yards away. The accuracy of the Z6 is also very impressive. You will be able to get the measurement to plus or minus 1 yard all the way up to the 1,300 yard maximum range. Accuracy is essential when using a tool like this, and the Bushnell Tour Z6 certainly delivers in this area too. As you get closer to the pin it is good to know exactly how far you are away. So from 125 yards and in, the Z6 will display your yardages in 1/10th of a yard increments. So if you have any of those tricky 60 to 80 yard shots you will know exactly how far the pin is so you can play the right shot each time. The display technology used in the Bushnell Tour Z6 is excellent as it provides you with really clear readouts of your yardages. Even in brighter weather you will be able to see everything extremely clearly. This coupled with the speed it retrieves the measurements for you makes for a very fast usage of this each time you need to get a measurement. This will ensure your game pace is kept up to the required speeds and you do not hold anyone up because of this. With Bushnell being such a consistent manufacturer of high quality golf laser rangefinders, you just know that each model they bring out will be of a very high standard. This certainly applies to the Z6. It is extremely easy to use and also provides you with incredibly fast and accurate measurements. The Bushnell Tour Z6 is great value for the price you can get it at, and will certainly give you a lot of really valuable help on the course.